Running since March last year, Anastasia may not have the same buzz as Aladdin, Lion King or Frozen. But, it should have. The musical was in my wishlist for some time, and now, after finally having had the opportunity to see it, I can say that it deserves your attention. And, in today’s post, I’ll try to explain the reasons that made me so enthralled with the story and the production. 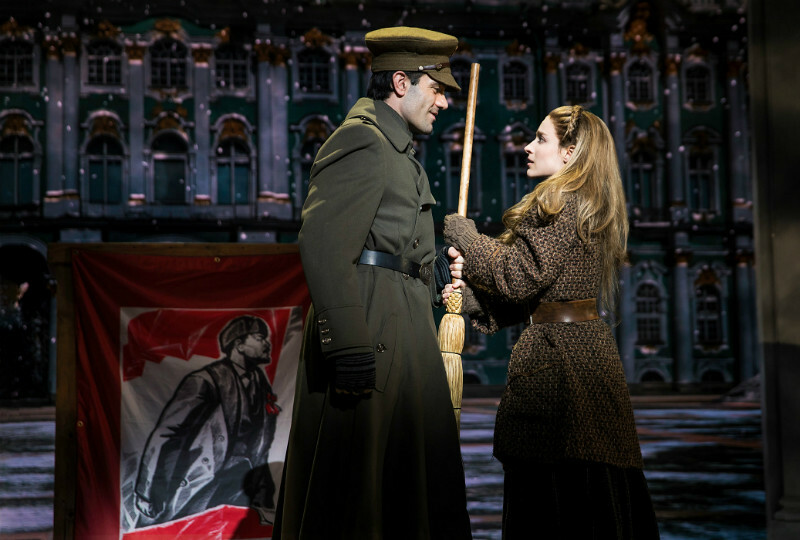 ANASTASIA IS NOT ON BROADWAY ANYMORE. We saw Anastasia with tickets from TodayTix. TodayTix is a platform (website and app) to buy Broadway and Off Broadway plays and musicals. It is simple and fast – and you get a confirmation e-mail and also a reminder e-mail. You get your tickets with a TodayTix agent, until 30 minutes before the start time. I’ve been using TodayTix for a while and I never had problems! Click here and buy your tickets! First of all, I think it’s worth starting by clarifying a super ordinary question: Anastasia is not a Disney musical. 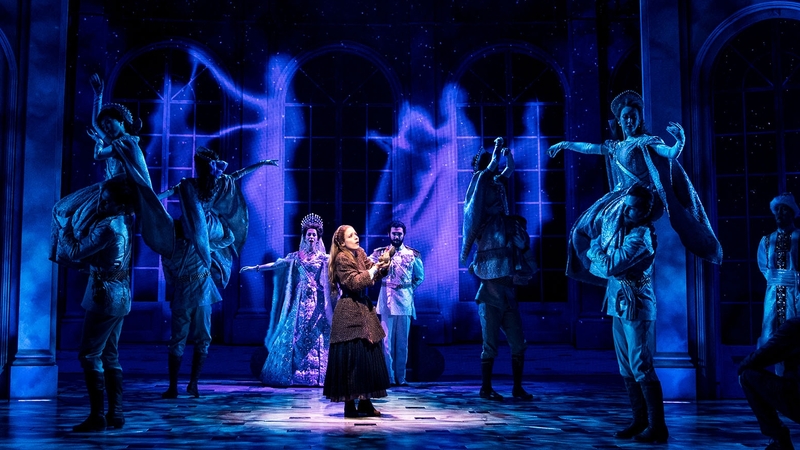 The musical is inspired by the Anastasia (1956) movie and Anastasia animated movie, released by Fox in 1997 – and not by Disney, as many people think. I did not watch the animated movie, but it was a blockbuster at the time. When I arrived at the theater, the only thing I knew about the story was that it happened in St. Petersburg (Russia) and Paris (France) and that the plot involved the protagonist searching for her family roots. Another detail that I need to highlight is the theater and our seats. 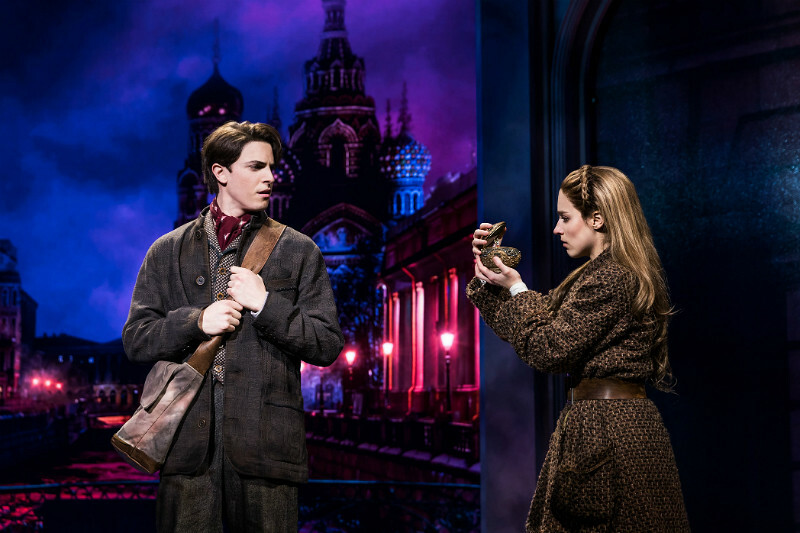 Anastasia is performing at the Broadhurst Theater. The theater has a beautiful architecture, is not very big and we (I went with my sister and a friend) sat on the mezzanine, in the fourth row. I have been in all theater areas and I confess that I was very surprised – positively – with the view of the stage. Incredible, really. If you, also like me, don’t know Anastasia’s story, I suggest trying to watch the animated movie before. It will certainly help in understanding the whole plot and make you enjoy production much more. To give a summary, the plot tells the story of Anastasia and her royal family, captured by the firing squad of Romanov, who kills her entire family. The girl is said to be dead – but the truth is that Anastasia survives. However, as she has lost her memory, she wanders through the streets of St. Petersburg, where people still wonder about the possibility of her being alive. Her grandmother, who left for Paris before the family murder, offers a reward to anyone who finds Anastasia – she becomes a living legend without knowing it. With the prize money in play, there are plenty of girls pretending to be her. This is where we are introduced to Dmitry and Vlad, who are planning to train the perfect trickster to be Anastasia. Anya, Anastasia’s name now, turns out to be a perfect candidate for Dmitry and Vlad’s plan. However, throughout the execution of the plan, the two end up being surprised by her performance, which reveals memories that even she did not know she had. After this brief summary, we can begin to highlight the strengths of the musical on Broadway and I could not fail to mention the scenarios. After watching Frozen, I thought it would be hard to love other scenarios. 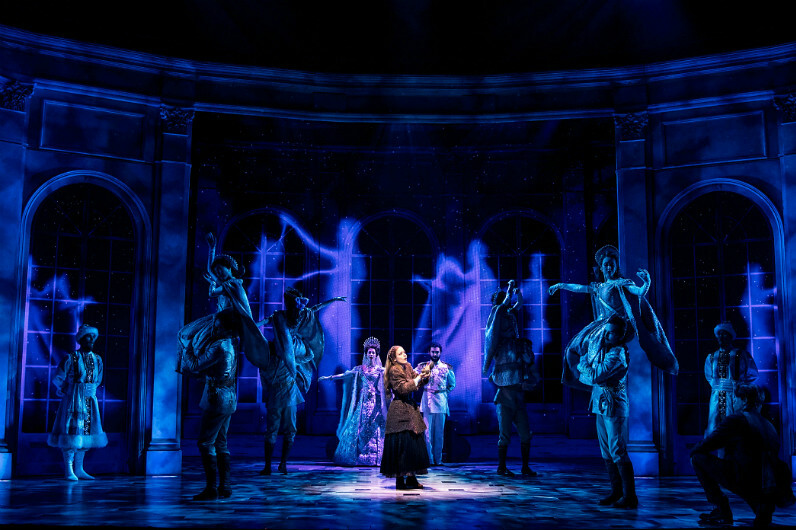 Anastasia does not have the special and magical effects of Frozen, but its gigantic screen that occupies the whole bottom of the stage transports us to the streets of St. Petersburg with precise details. 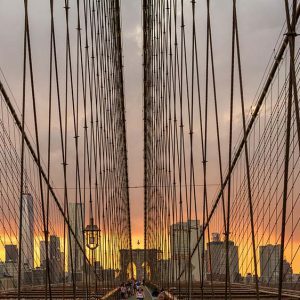 Both my sister and my friend were already in the city and they assured me that the scenery was faithful and charming as the city. 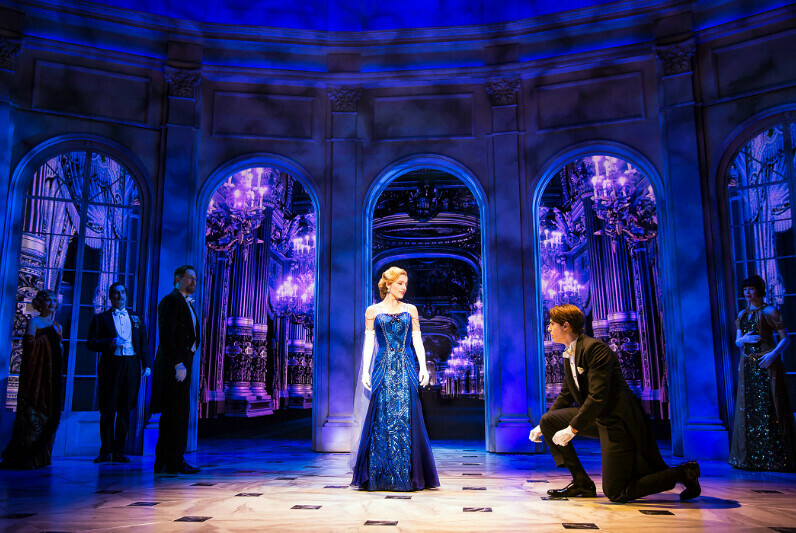 I can say the same about Paris – even the details of the Opera are reproduced on the stage of Anastasia. The speed with which the scenes change in front of your eyes also enchants – and transports you to the exact place that they want to show – be it the charming Alexandre III bridge or the train station in St. Petersburg. By the way, when the characters leave from the station to Paris, we managed to travel along with them. It’s amazing! I also need to mention the plot. What a nice surprise to know that a story of a strong female character got an animated movie for children in 1997. Anastasia is not a fairy tale, nor does the protagonist’s trajectory boil down to staying with a prince – which in this case, nor exists here. The protagonist is a strong and determined young woman, but also full of insecurities and doubts. Her love life is only a detail because the character is involved with a much bigger problem, which is discovering himself and finding his origins. In addition, it is worth highlighting the historical context of the plot – how much you know about Russia’s history – and the costumes, what perfection! To conclude my review, I could not fail to mention the humor touch. As usual, in Anastasia, we also have a funny character, Vlad (John Bolton), Dmitry’s friend. The actor is brilliant in his interpretation and got laughs from people! This part of the humor leaves the musical lighter and ended up having a lot of fun. Maybe he’s my favorite character in the play! Projections designer Aaron Rhyne traveled to Paris for inspiration and to capture the lush environments for the show’s backdrops. 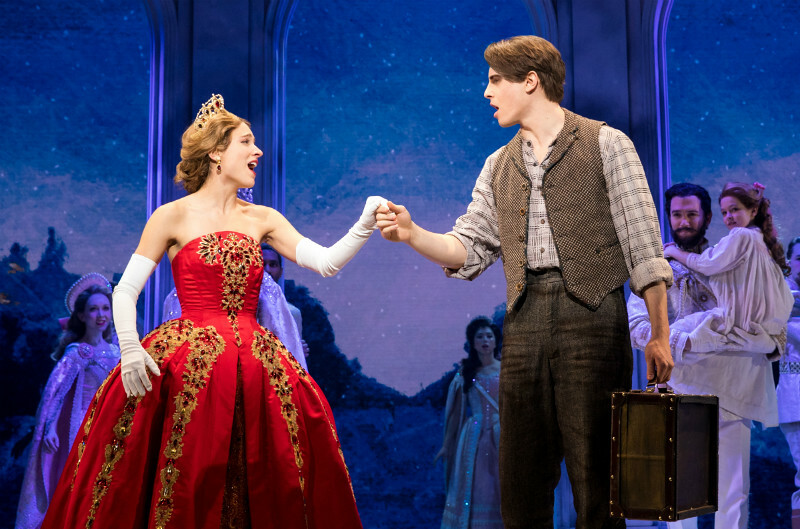 Christy Altomare, who plays the title character, dressed up as Anastasia for her audition and booked the role. We saw Anastasia with tickets from TodayTix.TodayTix is a platform (website and app) to buy Broadway and Off Broadway plays and musicals. It is simple and fast – and you get a confirmation e-mail and also a reminder e-mail. You get your tickets with a TodayTix agent, until 30 minutes before the start time. I’ve been using TodayTix for a while and I never had problems! Brazilian blogger, journalist & beauty expert in NYC!